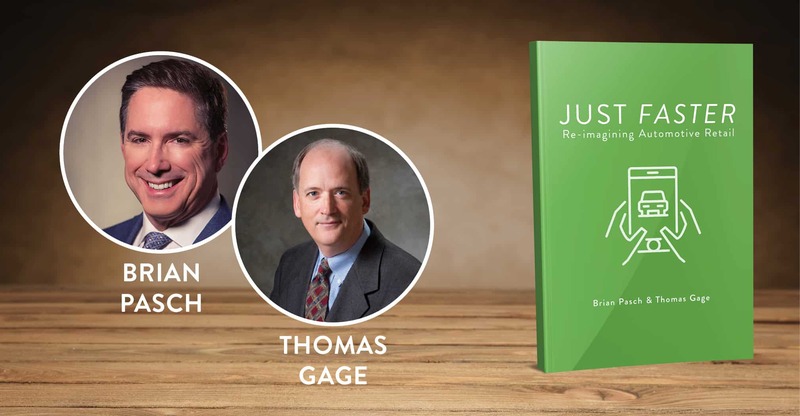 Brian Pasch and Thomas Gage come together to co-author their second book to tackle automotive digital retailing challenges and share insights on efficient inventory strategies. CHICAGO – November 13, 2018 – LotLinx, the automotive industry’s authority on inventory marketing powered by artificial intelligence, and PCG Companies, an award-winning Internet marketing company, have announced today the upcoming release of digital automotive expert and PCG CEO Brian Pasch’s much anticipated new book, Just Faster: Reimagining Automotive Retail, co-authored by LotLinx Chief Strategy Officer Thomas Gage. Gage and Pasch began working together to help dealership executives and managers better serve today’s consumers who spend less time in the showroom and have more control in the buying process. The pair have worked closely on the shift toward digital retailing and online sales for over ten years, also co-authoring the marketing attribution book, Who Sold It? in 2017. Since then, the need for another book that incorporates knowledge from the dealer community has only grown. Research conducted for the pair’s second book reports that only 23% of surveyed dealers would find it helpful for OEMs to mandate specific digital retailing technology, while nearly 85% prefer to receive their digital retailing insights from other dealers. Just Faster satisfies this want by featuring interviews with dealers from some of the country’s most influential automotive groups such as Larry H. Miller Automotive, Jeff Wyler Automotive Group, and Group 1 Automotive. From this research, readers will learn strategic insights derived directly from the authors’ conversations with dealers and customers on buzzing topics like vendor preferences, OEM initiatives, and organizational dynamics. It will be Pasch’s seventh research work on automotive retail and Gage’s second. Gage, who joined LotLinx in August, now specializes in AI-powered inventory strategies that achieve dealer objectives. His extensive knowledge of product, analytics, strategy, and acquisitions allows him to assist in the company’s development of their newest /AI/ solution for inventory-specific marketing, which will be released in January of next year. “It’s all about creating a better experience for both the dealer and customer. When you attract the right buyer through digital retailing, you are creating efficiency,” noted Gage. Just Faster will be available for an early edition release at PCG’s annual Automotive Analytics and Attribution Summit next week, November 18-20, and will be available to the general public at the NADA 2019 convention. To inquire about ordering your copy, contact the PCG team. LotLinx is the leading inventory marketing technology company for the automotive industry. Its proprietary /AI/ platform helps dealerships Sell Cars Smarter by increasing the efficiency and effectiveness of their digital marketing spend. In the past five years, the company has grown rapidly, earning it the No. 1 spot on Crain’s Chicago Business’ 2018 Fast 50 list, along with a spot on the Auto Remarketing Power 300 for 2018. Dedicated to delivering the best results at the lowest cost to their customers, LotLinx partners with many leading brands, including Audi, GM, FCA, Ford and Mazda, for Cooperative Advertising programs that reimburse up to 100% of a dealer’s marketing spend. Founded in 2012, LotLinx now serves thousands of rooftops including many of the nation’s Top 100 Auto Groups. To learn more, visit www.lotlinx.com.